UPDATED: Tue., Oct. 10, 2017, 3:52 p.m.
What is it? No. 8 Washington State (6-0, 3-0) tries to keep its unbeaten season alive when the Cougars travel to Cal (3-3, 0-3) for their second Friday night game in three weeks. Where is it? Memorial Stadium in Berkeley, California. When is it? Friday at 7:30 p.m.
Where can I watch it? The game will air on ESPN. Who is favored? The Cougars are, by 13.5 points. Why WSU will win: The Cougars rank No. 23 nationally in total offense, No. 11 in total defense and have a kicker who’s made 12 of 13 field goals this season – and Erik Powell’s lone miss was blocked. Cal is ranked No. 103 in the FBS in total offense, No. 102 in total defense and kicker Matt Anderson is 7 of 12 on his field goals this season. If those numbers hold up in Berkeley, the Cougars should cover the spread without much trouble. Why Cal will win: It’s possible the Cougars will be missing as many as four defensive players who were starting at the beginning of the season. Defensive end Nnamdi Oguayo didn’t play in his second straight game, inside linebacker Isaac Dotson left the Oregon game in the first quarter, corner Darrien Molton exited at some point in the first half and another inside linebacker, Peyton Pelluer, is out for the season with a reported foot fracture. The Cougars have depth – that was clear when they gave up just 10 points to the Ducks – but they can’t afford too many more injuries, especially at linebacker. Backup middle linebacker Nate DeRider also left the Oregon game with an apparent injury and didn’t return. What happened last time? Washington State won its eighth straight game of the 2016 season – the last of the winning streak – against Cal, 56-21, at Martin Stadium. In a showdown between Air Raid offenses, Mike Leach’s system outproduced that of Sonny Dykes, as Luke Falk completed 36 of 50 pass attempts for 373 yards, five touchdowns and one interception. 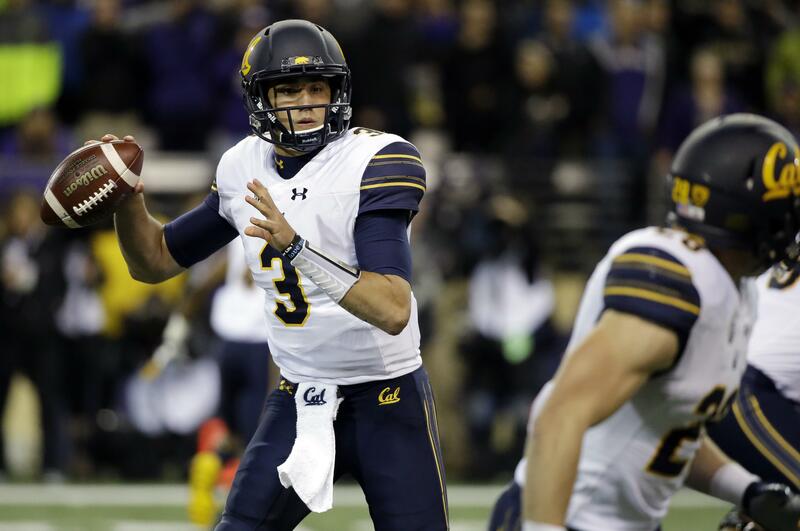 Cal’s Davis Webb, who was selected in the third round of the NFL Draft by the New York Giants, finished 34 of 53 with 425 yards and three touchdowns. 1. The Golden Bears are playing under a first-year head coach, Justin Wilcox. This is Wilcox’s first head coaching job, but he was a well-known defensive coordinator before accepting the position in Berkeley. Wilcox was the DC at Boise State from 2006-09, at Tennessee from 2010-11, at Washington from 2012-13, at USC from 2014-15 and at Wisconsin for the 2016 season. 2. The Cougars are familiar with Wilcox and also his offensive coordinator, former Eastern Washington coach Beau Baldwin. Baldwin was responsible for EWU’s latest golden era, compiling a stellar record of 85-32 during his eight seasons (2008-16) in Cheney. Baldwin’s 2010 Eagles team won the FCS national championship and three other EWU squads made it to the semifinal round of the playoffs. 3. There might be some friendly back-and-forth banter this week between Washington State Athletic Director Bill Moos and his son Ben, a true freshman tight end for the Golden Bears. Ben Moos played on both sides of the ball for 2A Pullman High and initially committed to Utah before re-opening his recruitment. The former Greyhound narrowed his list down to Cal, Louisville and Fresno State before landing on the Golden Bears. Published: Oct. 9, 2017, 4:18 p.m. Updated: Oct. 10, 2017, 3:52 p.m.